I did change some in my final layout and that is okay you can do it to! Doesn't have to stick to the sketch 100% but you still have choice to make something lil bit different but still look the same with the plan. I still use two photos even they are not square. To make my layout have some movement I tilt one of the photo. I created A4 layout so this 12x12 sketch still can be use on my layout. 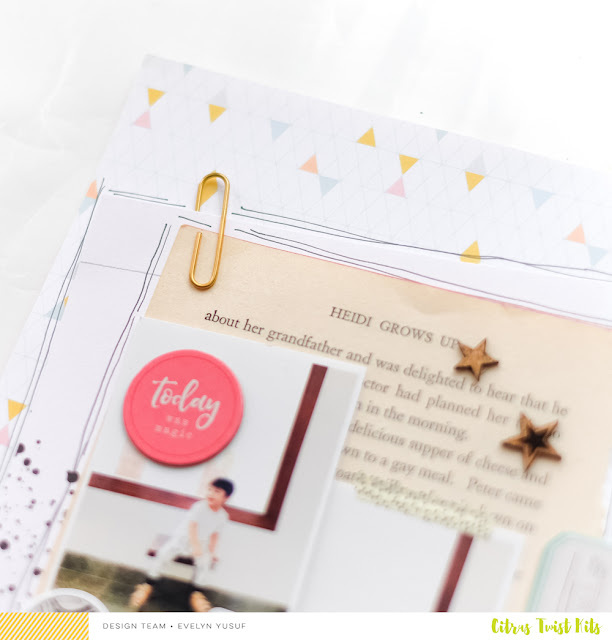 Instead of using big tittle at the top area, I use small chipboard the red circle one as my small tittle and move the big tittle after the photo using thickers. Again for the movement I tilt the pattern photo after the vintage paper. 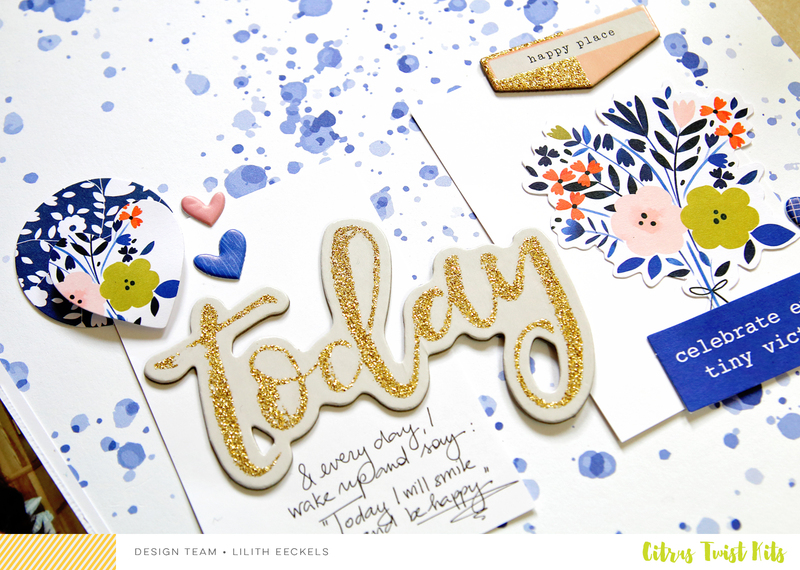 To play along with this week's sketch challenge, create a layout inspired by the sketch, upload it to the CTK Gallery with today's date (10/30) in the title, and you will be eligible to win a $5 gift certificate to the CTK Store! 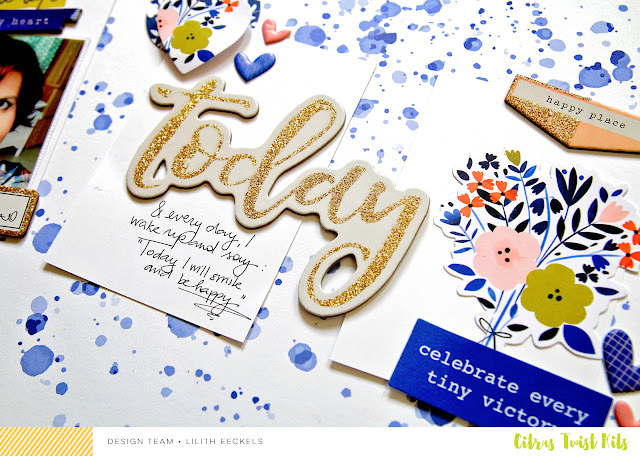 Hello and welcome to our weekly 3 to inspire post. For today's 3 to inspire I have chosen the following prompts. 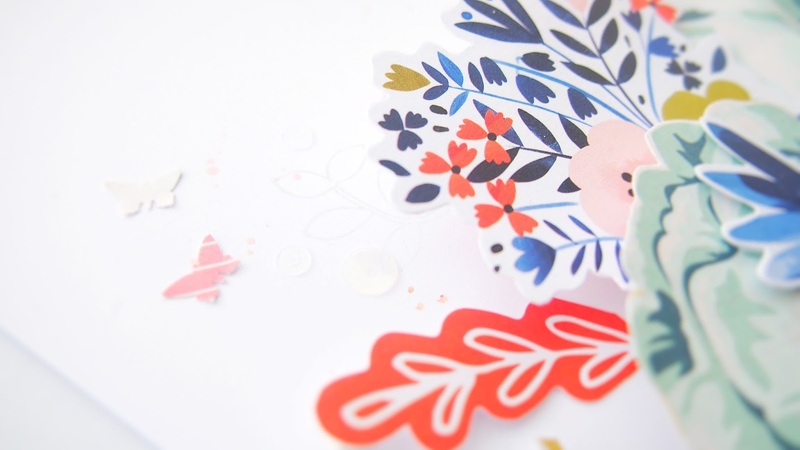 I decided to use the pink fresh paper as background paper and went for a simple design using 3 pieces of cardstock. I added my embellishments and title to that. When I use a busy background I tend to keep the rest simple. 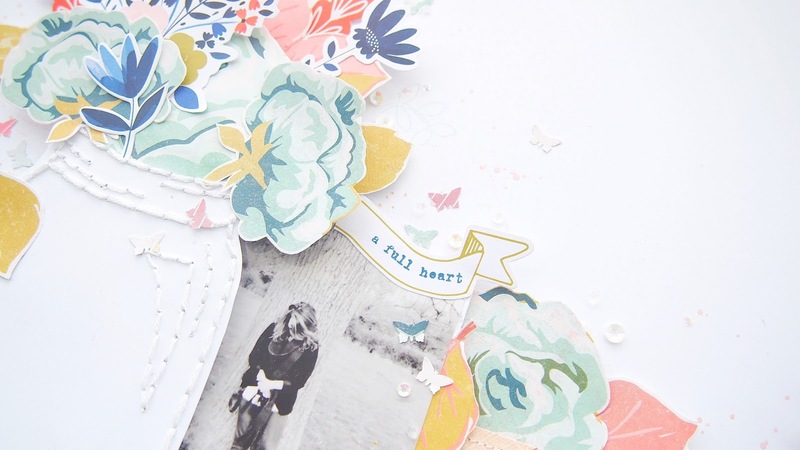 I used once of the chipboard embellishment as title and paired the hearts with die cuts from Pink Fresh Studio . I can't wait to see how you interpret the prompts. 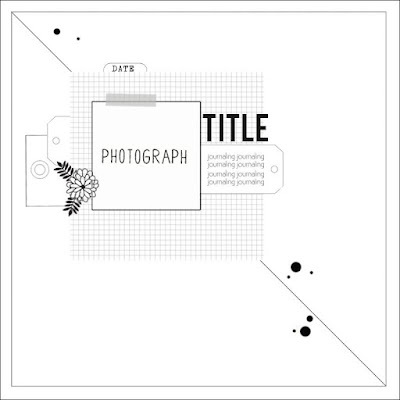 Remember: Use the three prompts to create your own projects and share them with us here in the gallery and/or our Facebook Forum. Better still there is Instagram too! Don't forget to tag @citrustwistkits and hashtag #citrustwistkits #ctk3toinspire. Hi lovelys! 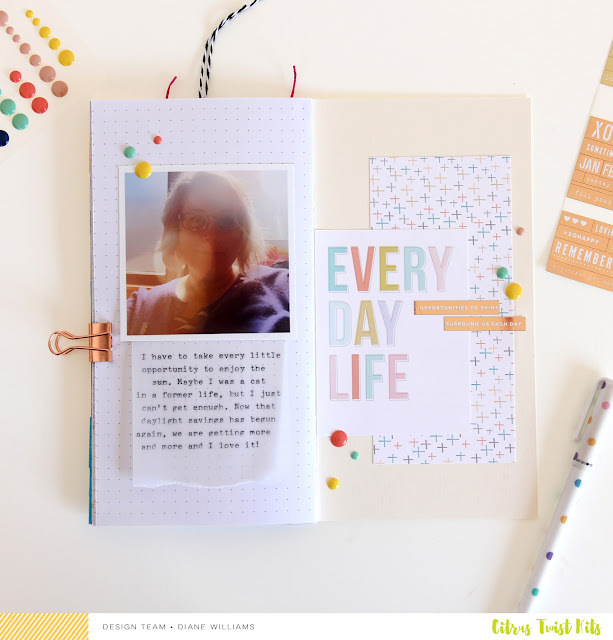 I'm super excited to share with you this simple project life sketch of mine. This year, I'm using a 9x12 album and I like to be able to keep everything in one album for the entire year so I try to keep things flat. I'm months behind with my PL but I try not to worry too much cause it looses the fun of documenting. 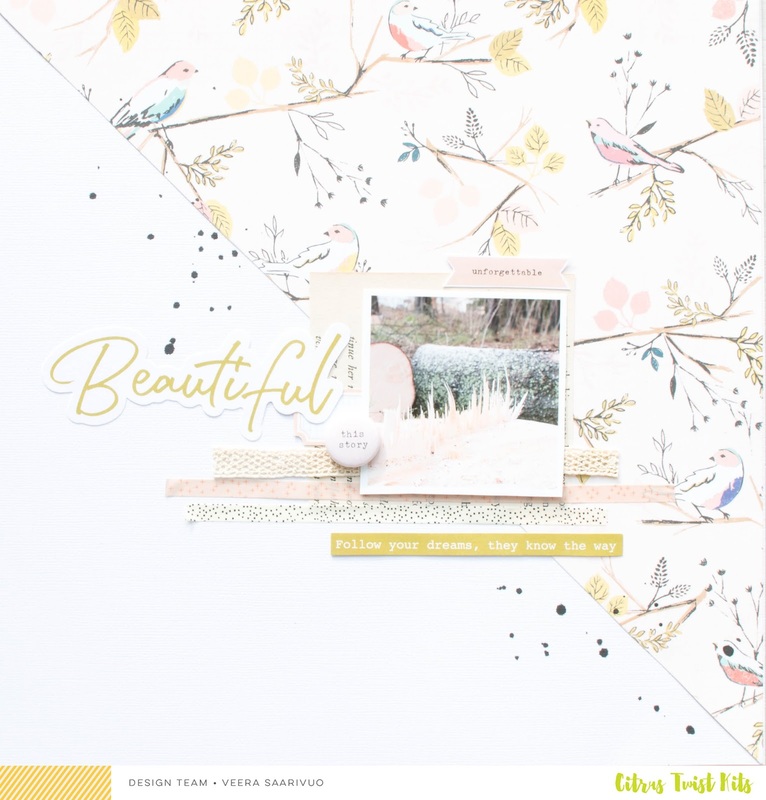 The Gather PL kit is my first DT kit and I love it! I couldn't help but be amaze with how pretty the products are and how well it goes together. Since I'm using a 3x3 page protector I cut down a bunch of journal cards as well as one special paper from the paper pad. 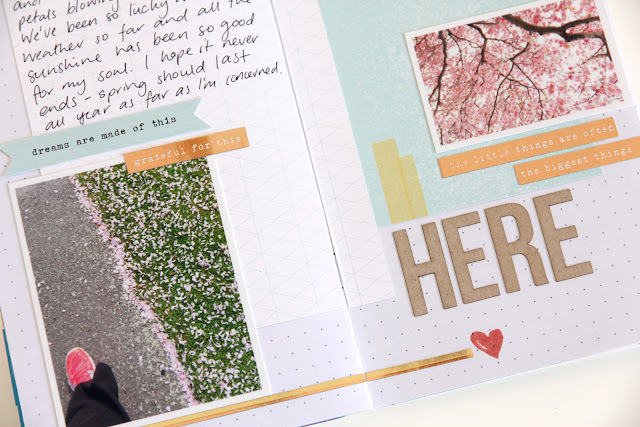 For this spread, I used a lot of customise cards with lots of stamps, cork embellishments, stitches, sticker sheets and journaling. "This Makes Me Smile" card is actually a pattern paper is from Maggie Holmes Gather paper pad that is part of the Gather PL kit. The Hello Weekend card is made from a plain American Crafts card stock and I use the clear stamp included in the kit to make my own patterned paper. Here is a shot of the whole spread for the event that happened my birthday month. 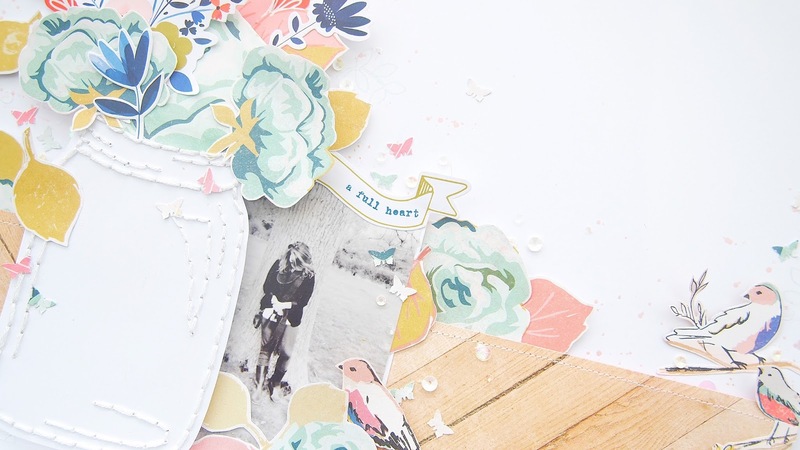 I love how flat and easy the embellishments that is included in the kit. You can't go wrong with a Citrus Twist PL kit. 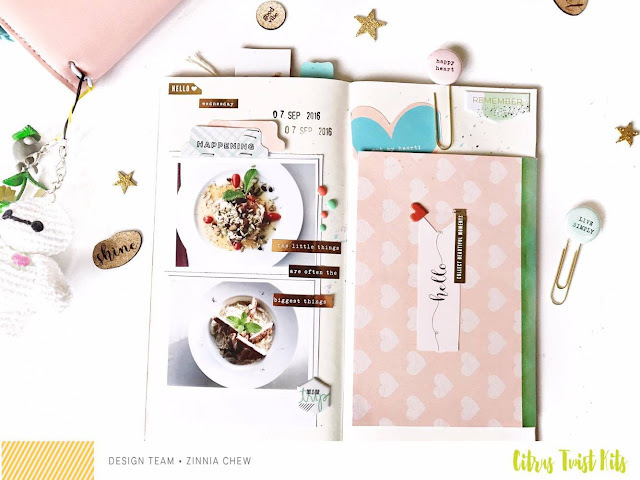 My main strategy when making a spread like this is repetition, to make it easier and concentrate more on memory keeping and documenting which is the more important thing. Check out the sketch that I use for this. Enjoy! Pls share your projects created using my sketch. I've never managed to completely kill a kit just doing Project Life. There are always a few scraps of paper, cards and embellishments left over at the end of each month. Instead of adding them to my ever-increasing stash, I often just quickly add a few pages to my Traveler's Notebook. 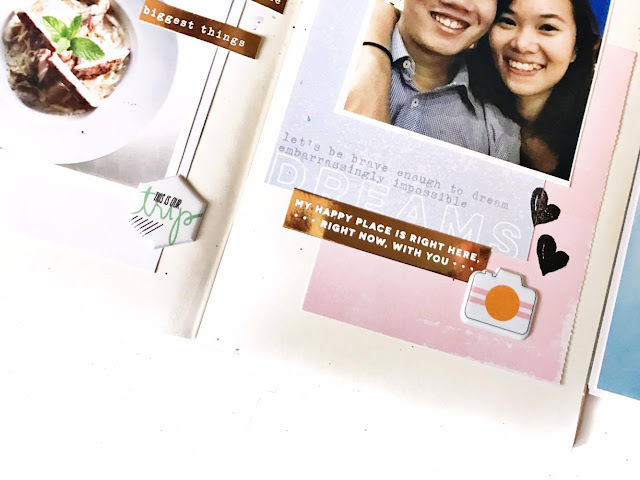 This page used a couple of journalling cards, along with my photos and a few stickers and pieces from the cut-apart sheet. 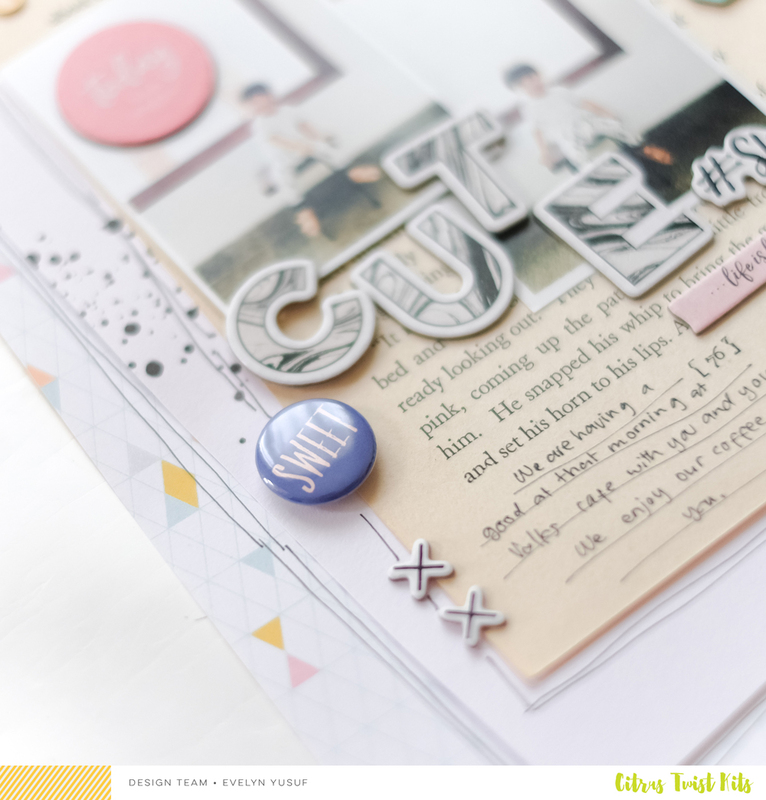 This second page used a journal card as a title, and a scrap of pattern paper in the background. 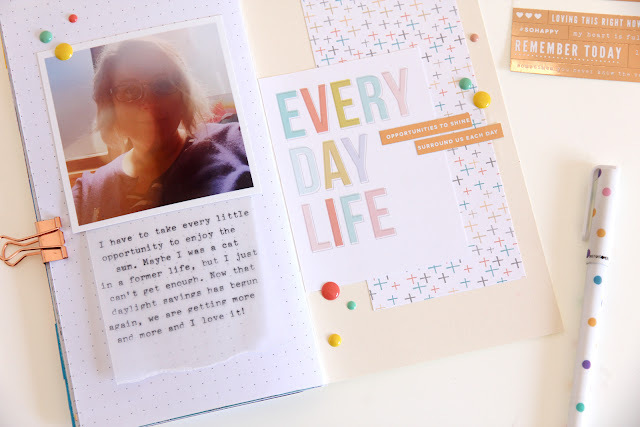 I typed my journalling onto some vellum, added my photo, a few enamel dots and some of those lovely metallic stickers. 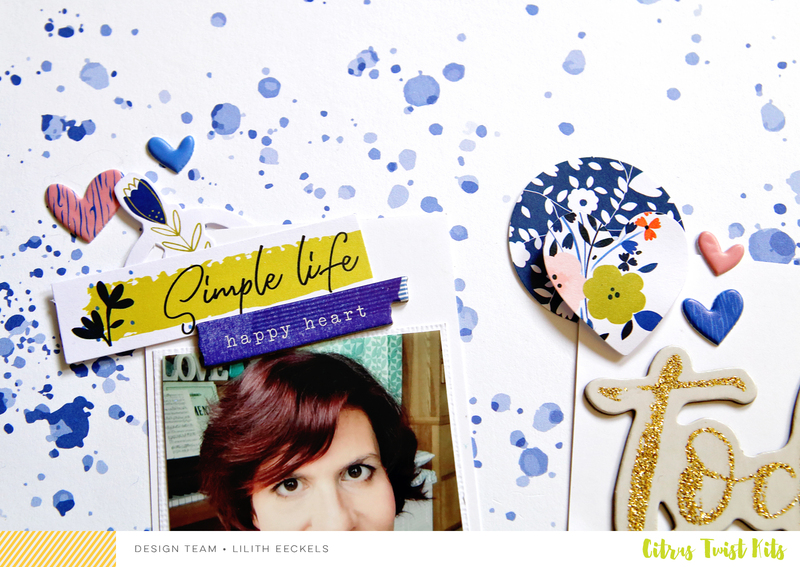 I think of these pages like tiny little layouts, but without all the pressure! Hello Hello! It's Zinnia here. 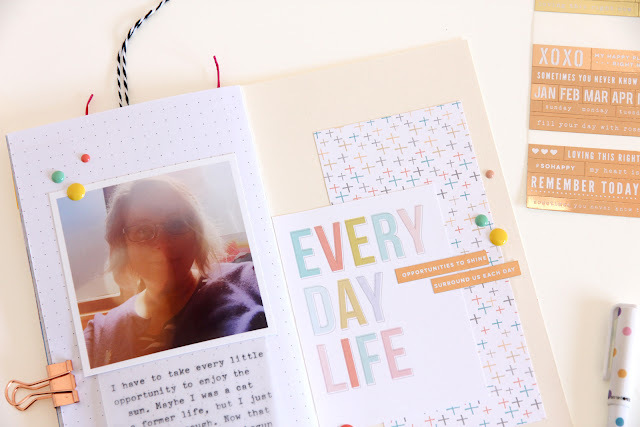 Today, I am going to share with you how i used my October Pocket Life + Sprinkle Kits in my Traveler's Notebook. Here is the finished layout/spread in my Traveler's Notebook. 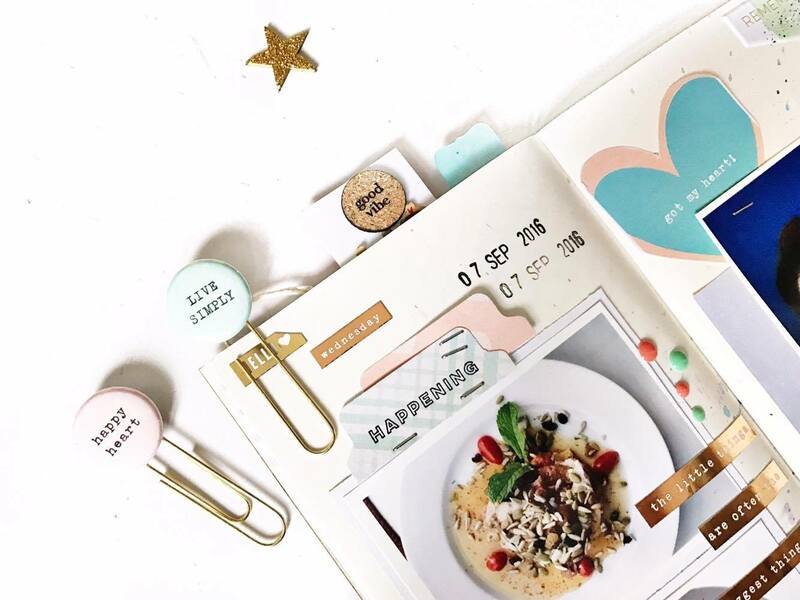 I am totally a Traveler's Notebook girl and obsessed with it! 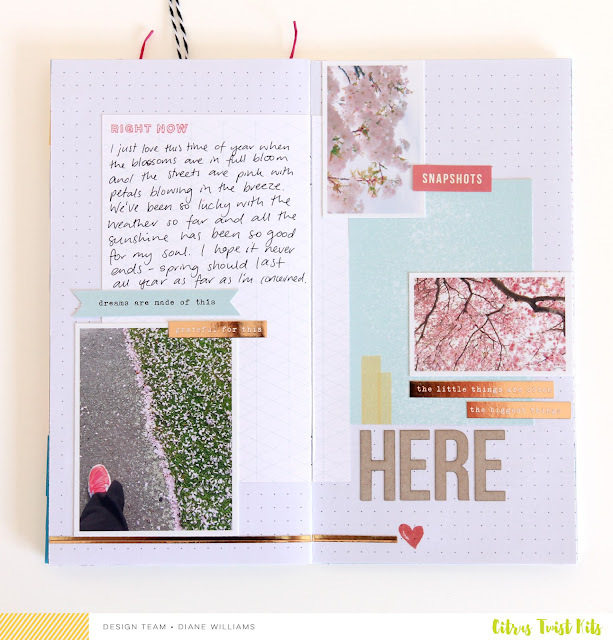 Its just so easy, quick and fun to document and create a layout in a Traveler's Notebook. 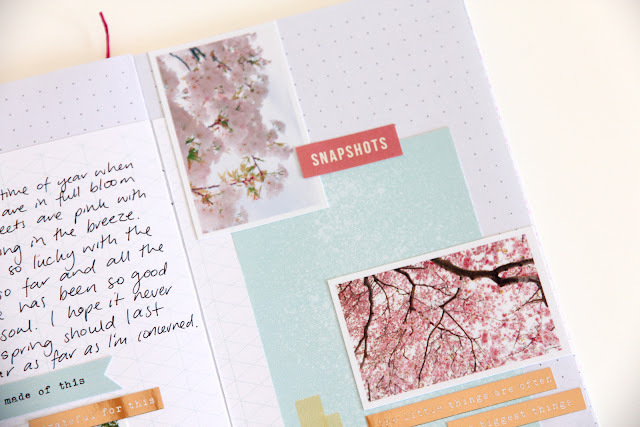 In this spread, I added tips-in using washi tape and 4"x6" journaling cards from the kits. I also used a lot of the puffy stickers as well as enamel dots that included in the kits which turns out perfectly. If you would like to see how i have created this spread step-by-step. I have a process video here to share with you ;) Thanks for dropping by! Have a great Wednesday! 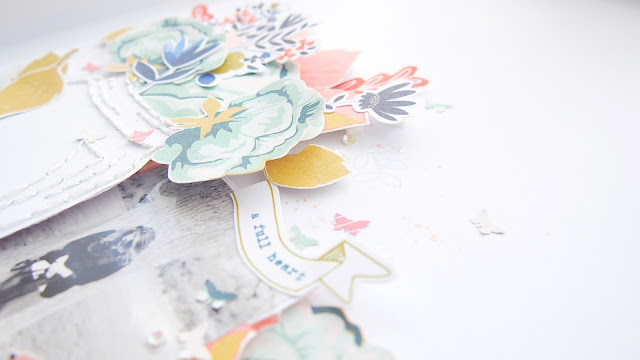 In the October Gracebox, I absolutely loved the die-cuts from Illustrated Faith. I saw there's a lot of LOVE words and that struck my mind to use this verse - ROMANS 5:8 God shows His love for us in that while we were still sinners, Christ died for us. As always, before I begin I will gather all my supplies. In the GraceBox, there's this Distress Crayon that I was dying to play with it and so glad I finally have this opportunity to do so. First, I drew circles using the distress crayon. Then, I used the water brush pen to dab onto the circles. Next, I used my finger to smear the crayon to create a "mixed media" look. You should get this effect. 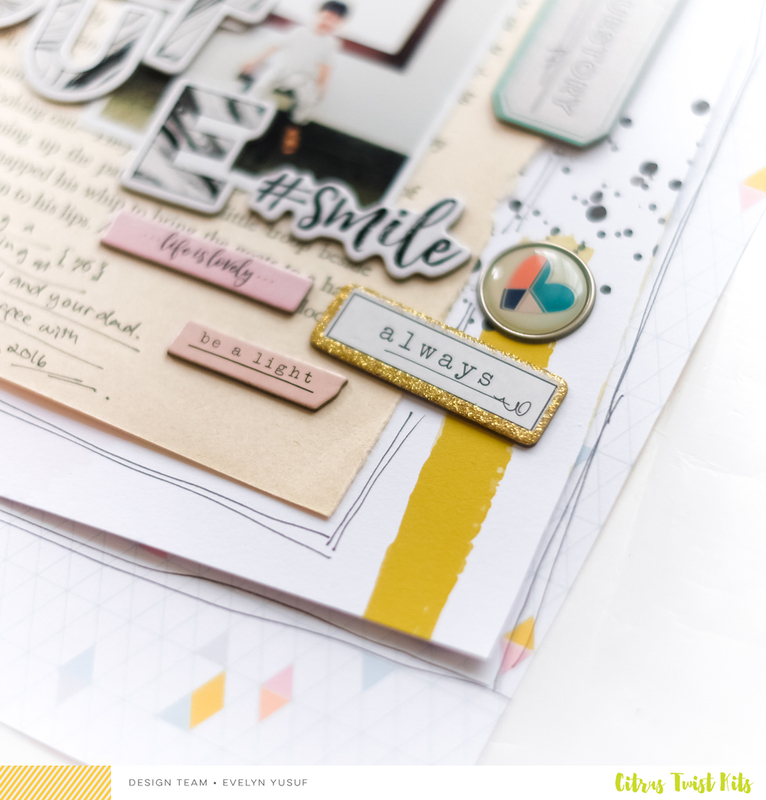 In the die-cuts pack, you'll see this yellow cross piece. 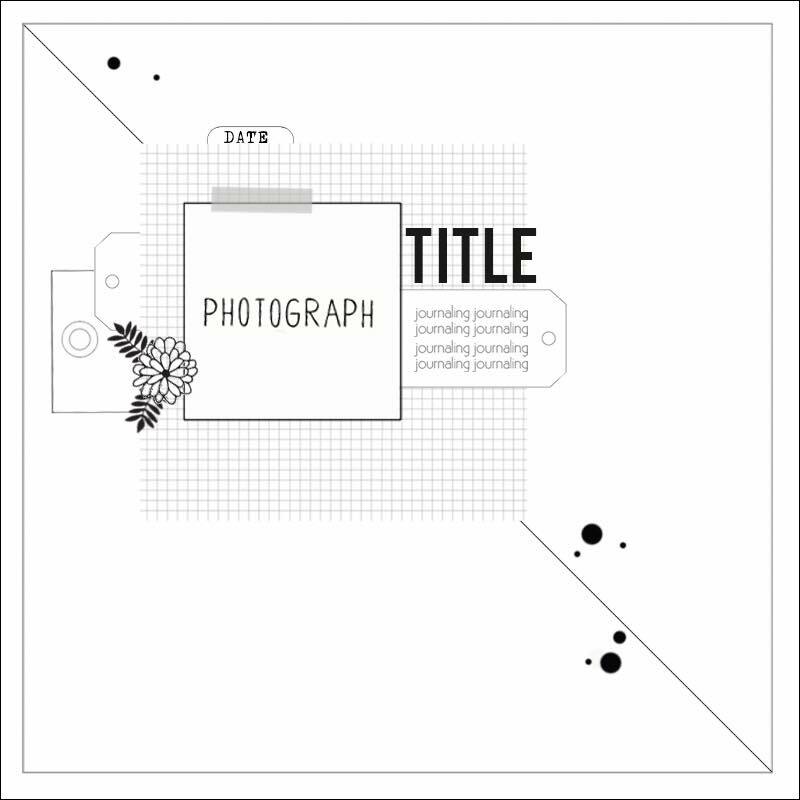 I used it as a stencil to help me to add design to my page. The outcome will look like this. Finally, I arranged the die-cuts before I adhered them down. What I added was the stamped word "forevermore", journaling, thicken the crosses with my brush pen and also added some mist splatters. If you are on Instagram, be sure to tag us @citrustwistkits to #CTKGraceBox. We would love to see your creations using the GraceBox kit. Today we are happy to announce the winners of the July, August, and September challenges! July: 3-stefcia; 10-jinnynewlin; 17-deshetrick3; 24-annau; and 31-mamakven. August: 14-aotto; 21-barbp; and 28-mamakven. September: 4-anna; 11-mamakven; 18-barbp; and 25-barbp. July: 2-celisemch; 9-sunie; 23-shellgell; and 30-barbp. August: 13-barbp; 20-stefcia, and 27-barbp. July: 1-stefcia; 15-sunie; and 29-krodesigns. 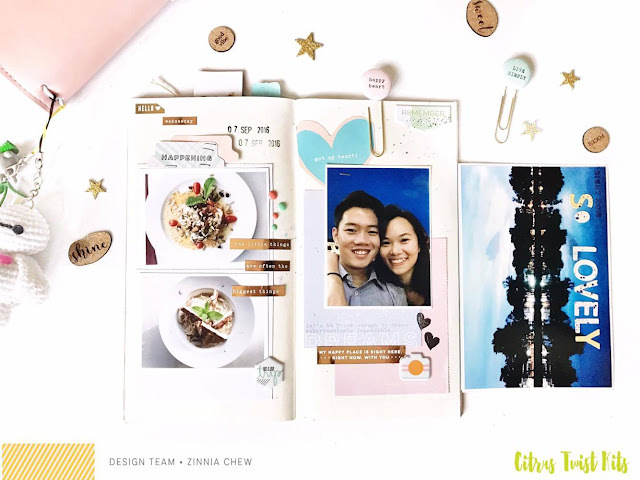 Winners, please email Trina at CitrusTwistKits@yahoo.com and include the name and date of the challenge that you have won in the subject of the email to claim your prize! Labels: 3 to inspire, Challenge Winners, PL Friday, Sunday Sketch. Happy Monday everyone! I hope you're all having a brilliant start to your week. I'm super excited to share my first layout on the blog, using this month's gorgeous Waverly kit. Autumn is by far my favourite season of the year. There's something so comforting about it getting slightly chillier, whilst the leaves turn into the warmest and brightest shades of red and orange. The air feels crisp and the clothes get cosier; I just love it! 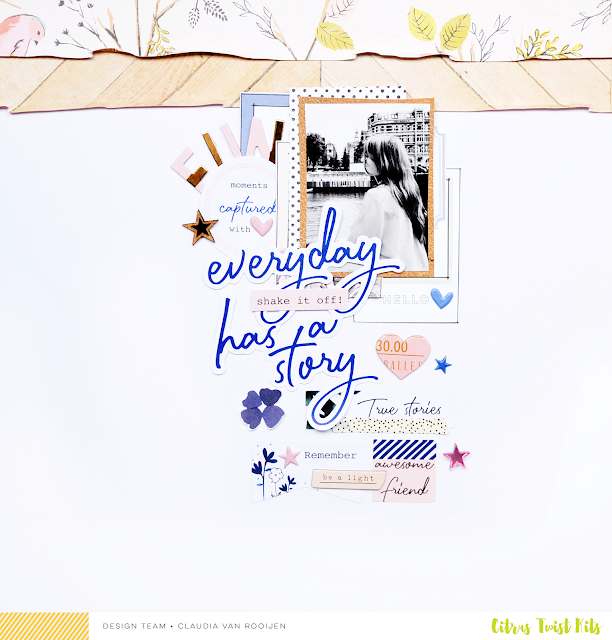 ... and that thought was my inspiration for this layout. Honestly! 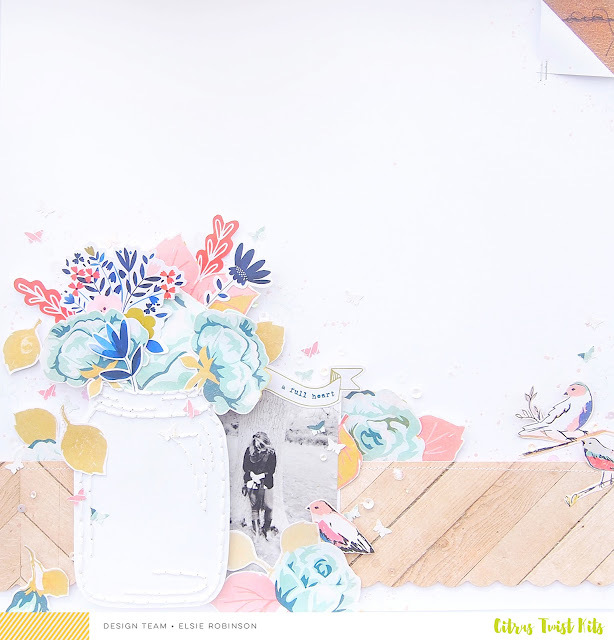 Mason jar + a Maggie Holmes floral = a match made in scrappy heaven! 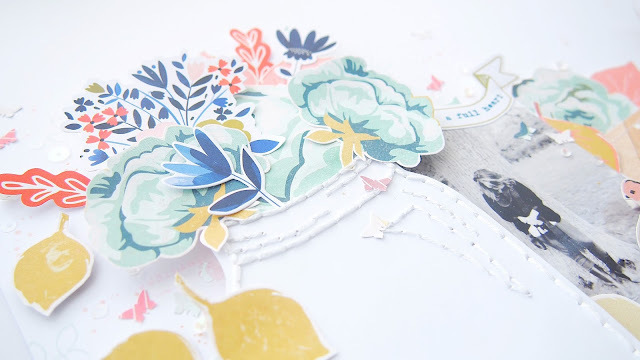 I'm having a bit of a love affair with a navy and burnt orange colour combination at the moment, and luckily for me, the Pinkfresh Studio 'Indigo Hills' ephemera pack had florals with that colour combo! They work really well with the Maggie Holmes flower's, and give the flower cluster a bit of a wilder and more organic look. There's a lot of foam behind those flowers, but it was important for me to make sure the flowers were all at different heights to make the cluster look dimensional and a also bit haphazard to get that organic impression. 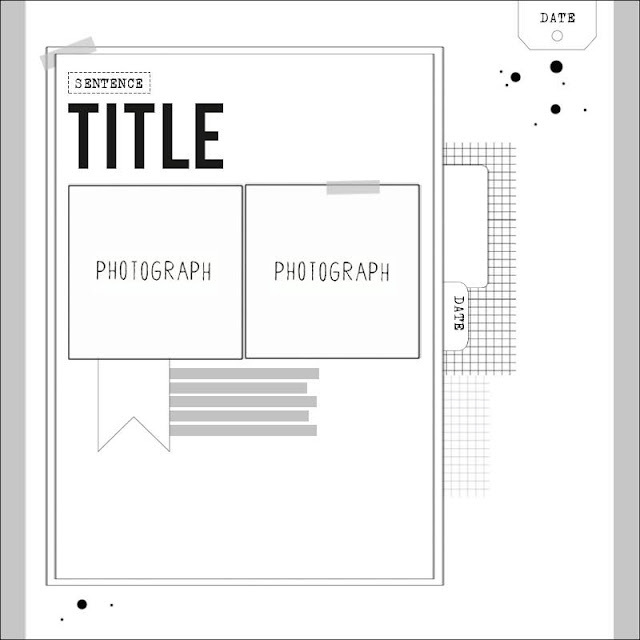 I played around with a few titles for this layout, but I wanted the mason jar to be the focus and all of my initial title options made the layout too busy for me. 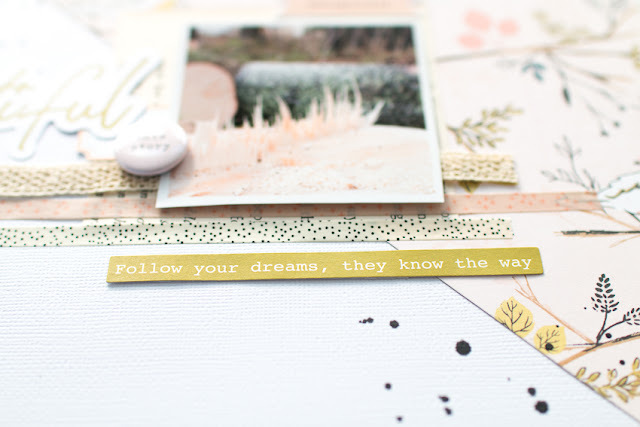 I decided to stamp 'a full heart', with some teal ink, on a banner from the Indigo Hills ephemera pack. Titles don't always have to be a main focus on a layout, sometimes it's nice to let the papers and the design do all of the talking! I hope all of your Mondays are off to good starts! Happy Sunday, it's Veera here today to share this week's Sunday Sketch. 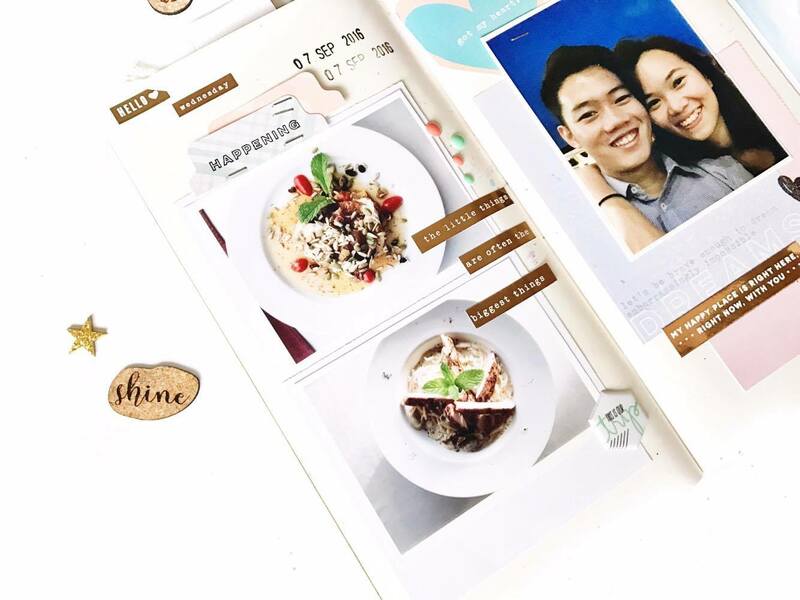 I love working with sketches as the sketches can help you step away from your go-to designs and try something new! I followed the sketch pretty closely, just turned it over. I really loved the diagonal line on the sketch! For this layout I used October's Waverly Scrapbook kit. 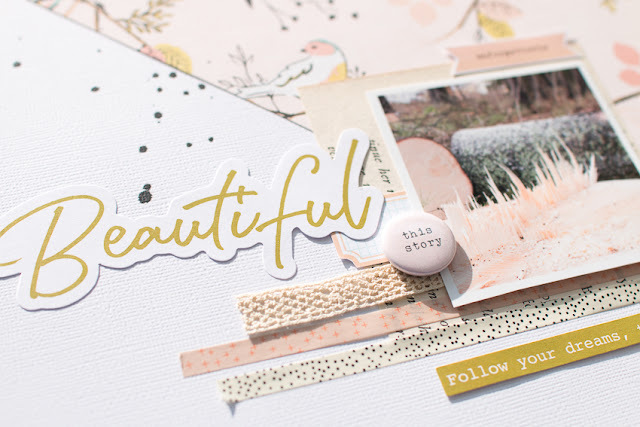 I loved the soft tones as they were perfect for this layout. Now it's your turn! 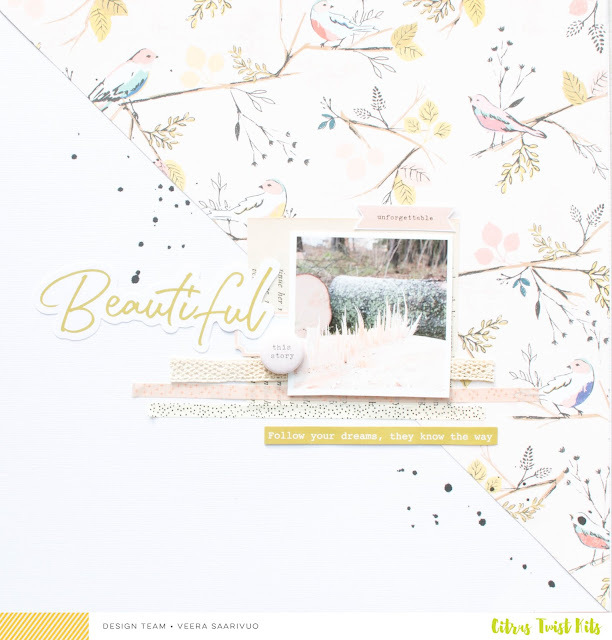 To play along with this week's sketch challenge, create a layout inspired by the sketch, upload it to the CTK Gallery with today's date (10/23) in the title, and you will be eligible to win a $5 gift certificate to the CTK Store! Good morning! This week I'm hosting the 3 to inspire weekly challenge and I'm so excited to be here with you today. This is my first post since joining the team and I can't wait to share more of my work with you. The first thing I did was decide which papers I wanted to use for the strips at the top. 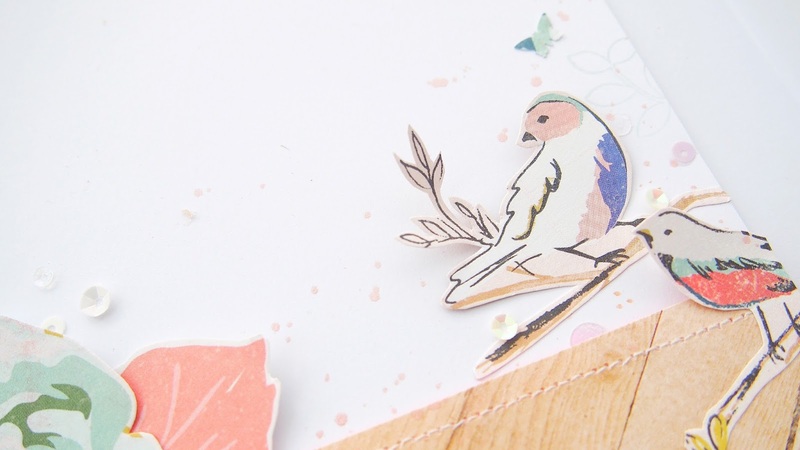 I decided on that gorgeous bird paper and the wooden one to create a little bit of balance. When it comes to tearing up the edges; anything goes! There's no right or wrong way to do this so tear away! If you want, you could fold up the edges so the other side of the paper is visible in a subtle way. I personally really love using black and white photos because it makes it so much easier to find colors that match (pretty much all colors). 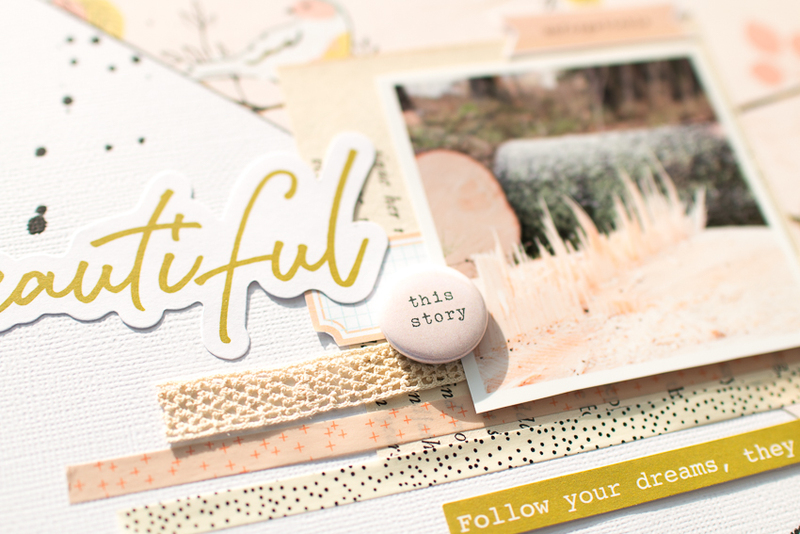 I love the Pinkfresh Studio Indigo Hills Ephemera that came in the Main kit this month so I wanted to try and use up as many of them as I could. Most of the time I just select a few bits and pieces that go with my layout but this time I actually pulled out the ephemera pieces first, decided on their placement, and then picked out my photo and everything else. 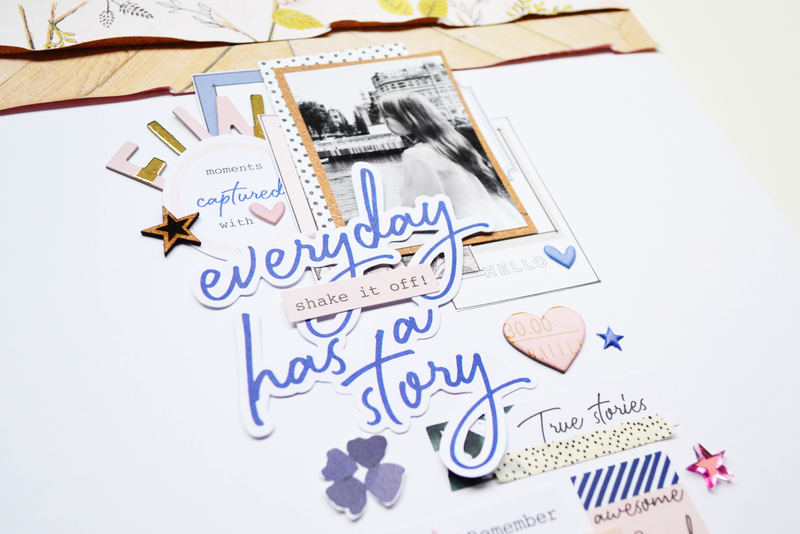 The ephemera pieces are the main 'feature' on this layout, but I needed something to fill in the empty spaces. 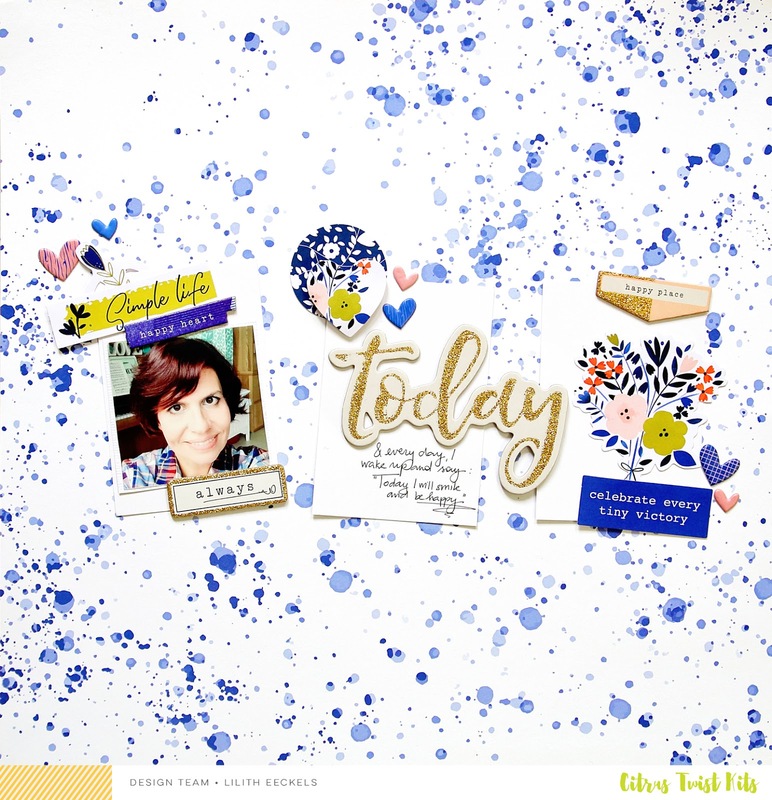 These exclusive puffy stickers were perfect to do just that; they are also a great way to add a pop of a certain color to your layout.